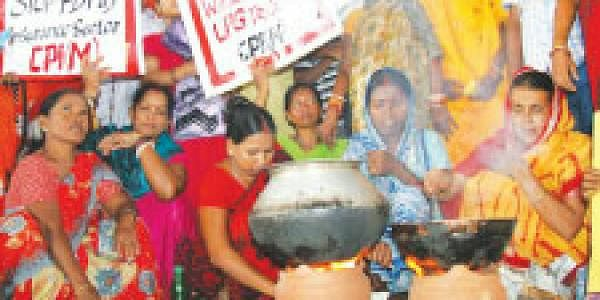 Condemning the hike in the price of LPG twice during the last one month, the Biju Mahila Janata Dal (BMJD) on Tuesday warned that it would launch a Statewide agitation if the decision was not withdrawn immediately. The BMJD staged a demonstration in front of the Raj Bhavan here against what it called an undemocratic and anti-people decision of the UPA Government at the Centre. Addressing a meeting on the occasion, BMJD president Pramila Mallik criticised the Centre for taking such a decision without taking into consideration its impact on the common man. How can the decision to hike the LPG price come to the benefit of the “aam aadmi” whose cause the UPA always champions, Mallik asked and said this would impose an added financial burden on the workers and lower middle class households. The BMJD submitted a memorandum to the President through the Governor demanding roll back of the LPG price hike. The protest meeting was also addressed by BJD MLAs Arabinda Dhali and Pranab Prakash Das, Bhubaneswar mayor Anant Narayan Jena, Biju Yuva Janata Dal (BYJD) spokesman Bijay Nayak and several other senior leaders. The activists of CPM and BJP also demonstrated in the Capital against the price hike.